If you have seen Instagram photos of our office space, you're in the know about the massive collection of books and magazines we own. If you haven't, see Exhibit A. E-readers? Hella no. It's print forever in our world. Putting aside the sheer volume we have, the weight alone causes our shelving to cave in the middle. That doesn't stop us from adding to the collection. But it had made our friends express that they will never again help us move 100 lb bins of books into another space. 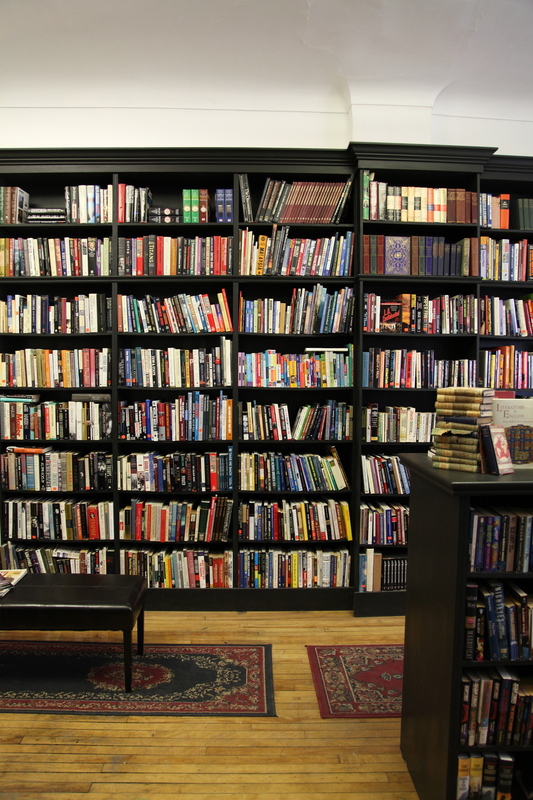 Hamilton is home to a number of independent bookstores, each filled with unique gems. One we frequent often is The James Street Bookseller. Jacklyn recently scooped up a copy of Pardon My Lunch Bucket for me. Open in one location or another on James South for six years now, Monique Doepel originally stumbled into the current space while looking for locations to open a cafe. "When the opportunity presented itself, my love of books and old buildings got the better of me and here I am," says Monique, "I enjoy everything about this place. There are so many interesting characters and conversations everyday." With the help of local artist Charlie Pipe the bookstore is now home to a featured artist every month in the renovated cellar. "When I first opened the store at this location the downstairs was basically a storage space," Monique tells us, "However it was warm and had a gorgeous exposed brick wall that was just asking to been seen. The idea grew to transform the basement into a room for book clubs, readings, artists and what have you." It's an unexpectedly cozy space and Monique loves to see the surprise on the face of a customer when she brings them downstairs to see the room. "As I said, I'm a huge fan of these old buildings," Monique enthuses, "With the addition of the monthly art shows it feels like it is finally seeing it's potential realized." Leveraging the foot traffic on James Street, Monique and Charlie have been scheduling the opening night for the art shows on the same night as Art Crawl. The Hamilton Conservatory for the Arts (where Jacklyn works) does the same. "Personally, I have always started Art Crawl with a bite to eat on Augusta Street or James South before heading down to The Crawl," says Monique, "Many others do as well, and it's been wonderful to see the turn out for these shows. It's inspiring to see the support Hamiltonians have for the arts and their community." We love that The James Street Bookseller welcomes book trades. "One of my favourite things about book trading is the interesting and ever-changing variety of books that cross my desk," says Monique, "We have all the usual suspects, including books by local authors and a rapidly growing collection of antiquarian books." And of course, she is always happy to order new books upon request. You can stay in the know by following the shop's Facebook page where Monique posts the shop's newest treasures.